The marketing strategies that may have worked in the not so distant past (2017, even) are rapidly ageing and becoming less effective. The modern business climate evolves on a daily basis; continually adapting to emerging technologies and fresh perspectives on what the best ways to market products and services might be. If you don't keep up with these tactics and strategies, you run the risk of watching the business you worked so hard to build struggle and fail, while the more commercially aware of your competitors reap the benefits. In years gone by, customers would spend less time researching a product or service provider before making a buying decision as information was less readily available at their fingertips. As of June 2017, 51% of the world's population is connected to the internet. That's a lot of people with tools to easily view content about both you and your competitors, and the quality of that content will inevitably determine who they trust with their custom. In 2018, not producing quality content on a regular basis will contribute towards online business failure. Both B2B and B2C customers are becoming heavily influenced in their decisions by engaging content designed to push them further down the sales funnel. Of course, producing compelling content isn’t just about writing what you think potential customers want to hear about. Search engines, such as Google, will continue to play a huge part in buyer behaviour as a gateway for consumers to find relevant content defined by their search terms. Your content must be SEO-conscious with strategically targeted keywords to rank high on SERP’s and be seen by more people. Find space in your marketing budget to start strategising and producing content yourself, or arrange a consultation with a Digital Marketing Agency who provide inbound marketing services and outsource to them. 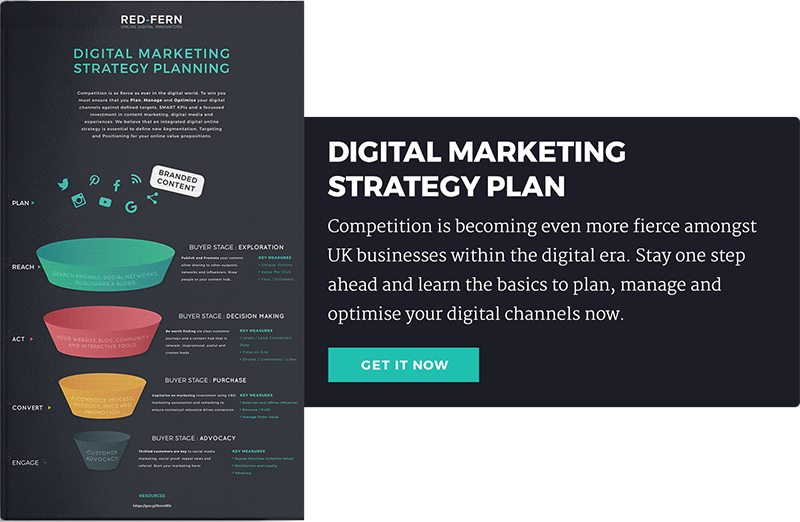 Agencies, such as Red-Fern, have specialised knowledge as digital innovators and Hubspot partners. We know what a piece of content needs to be successful and rank on the first page of search engines. Whether you’re a multinational corporation or a local sandwich shop, everyone knows that you need a website, even if your business isn’t primarily based online. It’s the digital face of your company and a crucial part of the business plan. What the modern business owner has to catch up on is mobile device optimisation. Now that one-third of people use their smartphone as their primary device to access the internet, you need to make your site easy to navigate and easily viewable, or you risk losing credible leads at the first touch. Mobile users have different objectives than desktop users, and usually, this means they want information in quick, easily digestible bites. Access to a mobile device means that customers are starting to research much more thoroughly before making purchases-82% of smartphone users say they consult their phones on purchases they're about to make in a store. This relatively new practice reduces the chance a potential customer will make an impulse buy without first visiting the website of the business they're about to buy from. Judging by those statistics, there may even be an argument that impulse buying is a thing of the past. Does your website load in less than 3 seconds? Is it easy to navigate using your fingers? Is everything scaled properly to provide a good UX? If you answer ‘No’ to anything on this list, it’s time to address the issues your site has (if you have the knowledge), or employ someone to manage the process or seek external help through a web agency. Due to customer choice reaching an all-time high and attention spans have dipped to an all-time low, it has never been more important to maintain good relationships with your customers. Companies need a more customer-centric approach to keep their clients interested, as they demand a personal experience to stay engaged with products and services. Your existing customers are your advocates. They're the people that will generate your referrals, which makes them a key cog in your lead generation wheel. So when you’re asking yourself “Why is my Business Failing?” your answer could be that you’re spending too much time focusing on acquiring new business when you should be concentrating on nurturing business you’ve already won. With the probability of selling to an existing customer being 60-70% when compared to 5-20% for a new customer, stakeholder retention will be just as important as gaining new business going into 2018. 1. Firstly, make sure that in every interaction with potential and current customers, your company’s voice is enthusiastic and welcoming. After that, consider the question of whether your company is solving peoples’ problems; especially your existing customers. Providing your customers with a solution to a problem they face or a way to achieve the goal they’re working towards is, at the end of the day, why they’ve come to you in the first place. 2. Secondly, delight your existing customers! Go back to them after acquisition and conversion and give them reasons to engage with your brand. Give them incentives that only current customers have access to. Build a solid foundation of trust, so that they're confident enough in your product to advocate it to other businesses. This will help you gain those new customers you were initially after in a way that ensures you retain the ones you’ve already got. No matter the size of your business or what industry you happen to operate, in the year 2018 you should engage in an SEO campaign to help you get more customers. After all, it’s the keywords and content on your website that help people find you, and the links you’ve got on the web that help increase your brand awareness. With 61% of marketers now saying improving SEO and growing their organic presence is their top marketing priority, it has never been more critical for business owners of ALL sizes to make SEO a key consideration in their budget. Social Media is fast becoming an integral pillar of the SEO model. While experts still aren’t sure if it directly affects rankings- what it does do is get your content seen by more people, which will naturally generate traffic and in turn, increase leads- if your content is of good quality. With the number of people on social media, its worldwide reach and its ease of sharing, social media is a great way to quickly build your internet presence and build an awareness of your brand. If you want to be found among the millions of sites on the web and avoid online business failure in 2018, social media needs to become a higher priority for your business. Firstly, if you haven’t already, get with the times! If you want to be successful in the modern business landscape, you should devote a decent chunk of your budget to SEO and social media marketing. Dedicate what budget you have to highly targeted paid social campaigns by boosting content that is already getting traction. Invest in a Digital Marketing Executive at your company or outsource to an agency with experience in SEO. Learn about Google Algorithms (how Google measures what it should be ranking) or take up some classes on Search Engine Marketing. Short answer: You spent too much time thinking short term, getting unqualified and uneducated leads. Marketing in 2018 is a long-term commitment, not a campaign. A lot of marketing strategies aren’t designed to convert leads immediately. The goal is long-term, continuous engagement, especially with high-value purchases and services. In fact, many of our leads at Red-Fern have been in our funnel for quite a while. And that’s fine — we’ll check on them every so often, but overall we’re happy to wait for the right time for THEM and their business. The more our leads engage with our content; the more educated they become about our company. In the meantime, they start to see us as a reliable resource for quality content. That keeps us in the back of their mind when they do decide they're ready to make a buying decision. Start building marketing plans for the long-term, which last for a full calendar year at the least. Follow up your activities with reporting to measure its success. Once it’s up and running, a successful long-term marketing plan will pay lifelong dividends. Consider investing in content marketing. In 2017, companies that published 16+ blog posts per month got about 4.5x more leads than companies that published 0-4 monthly posts. In 2018, we suspect these stats will continue to rise, and companies that place budget in content and inbound will grow even further when compared to competitors who are living in the past, still struggling with traditional marketing methods that are dying a slow death.